Nothing purges that up-all-night feeling better than a simple soak. It seems basic, but too often, moms postpone it for later. You might think you'll have a chance when the baby takes her midday nap. Don't count on it: Chances are, before you know it, the afternoon will be winding down and you'll be feeling grungy (and maybe a little grumpy about it, too). So jump in the shower before your partner heads for work. You'll start the day refreshed and ready for all that the baby tosses your way - even the spit-up. We're not suggesting going cold turkey - who doesn't deserve an ice pop at the end of a hectic day? But too much of the sweet stuff too fast, especially on an empty stomach, could send your blood sugar levels to the ozone. That spike will lead to a crash, leaving you sluggish and unable to deal patiently with the diapers and feedings, which in turn takes a bite out of your self-esteem. So instead of scarfing down a whole cookie before lunch, better to start having tiny postmeal treats. The healthy fare will keep you feeling full longer and give you the energy to care for the baby throughout the day, says Brielle Alpert of NuKitchen, a New York City-based healthy meal delivery service. Eating well is even more crucial if you're breastfeeding, as what you eat nourishes the baby, too. Wearing maternity clothes when you're not pregnant is just plain depressing; barely squeezing into your old clothes won't make you feel great, either. Though you may worry about "wasting" money on new outfits you'll (hopefully) ditch once you've lost all the baby weight - (don't worry, it's not impossible) - there's no working around the fact that clothes that fit well make you feel good. You don't have to buy a lot; a few new tops and one or two new bottoms can work wonders. What could be a better investment than something that boosts your spirits, which in turn allows you to approach parenting much more joyfully? Budget doesn't allow for new duds? Check out secondhand stores or online auction sites. When the doldrums hit - and they do, even for the most upbeat new moms - take a walk. According to a 2007 article published in the "Journal of Midwifery and Women's Health," exercise, particularly strolling with the baby, can ward off postpartum depression. It also allows you to melt away baby weight slowly. 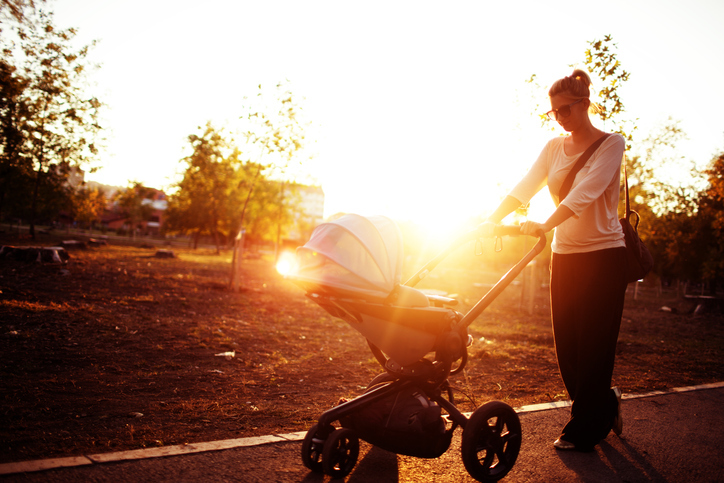 Make a daily date with your baby; strap her into a carrier or stroller and run your errands on foot. Inevitably, you'll have days when you just don't feel like making the effort. You're human, after all, and an exhausted human at that. If you find yourself skipping our tips once in a while, don't worry; you can start all over again the next day. And remember: You've already done something amazing. You've become a mom.